Building (that is, customizing a vehicle with aftermarket accessories) has almost become an art form for today's Jeep owners. The Jeep Wrangler has particularly been a choice model for this hobby. The key to a great build is having the flexibility to add more and more accessories, and that is why the ARIES Jeep line is diverse and innovative, giving you a wide selection to keep building and fueling your passion. For building a customized look, TrailChaser® bumpers feature a six-piece, interchangeable design with up to 24 different configurations. Our TrailChaser® bumpers, TrailCrusher® bumpers and light mounting brackets are also excellent choices for adding aftermarket lights. 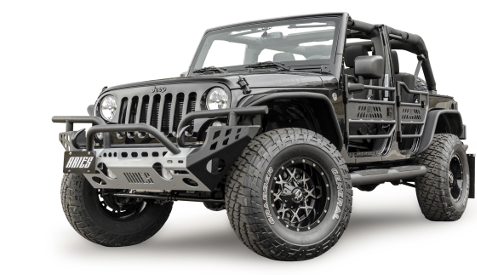 We also offer vehicle-specific grille guards and bull bars for various Jeep models. For building the ultimate off-roader, we carry tube doors, fender flares and our removable mud flaps with no drilling needed on the Jeep JK. 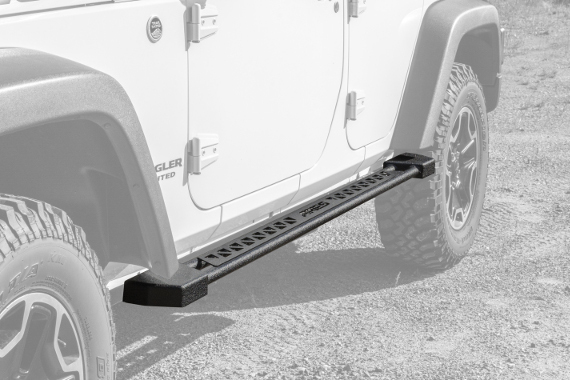 Our TrailChaser® bumper accepts tow hooks and a winch for functionality on the trail. 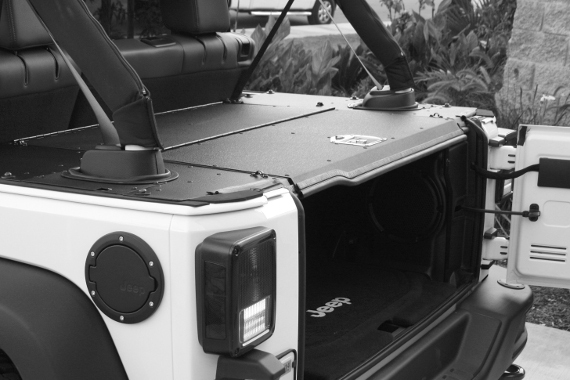 To keep your items secure, our security cargo lid offers a fully lockable enclosure that integrates with the layout of the Jeep. ARIES Jeep rocker steps offer extra side protection and a convenient step up. While many rocker panel protectors are simple steel panels or tubes, ARIES Jeep rocker steps have a wide, flat profile that provides two key advantages. First, it offers a convenient, comfortable step up into the Jeep. The double-tube layout and welded top plate create a sturdy, 3" wide stepping surface. Second, the flat design offers added ground clearance. Unlike some side bars that are mounted down and away from the vehicle, ARIES rocker steps are set high enough to clear brush, boulders and other off-road debris. They also feature a durable textured black powder coat finish to resist rust and hide scratches and grime. The ARIES Jeep security cargo lid is the perfect line of defense for your items when you're out on the trail. This integrated security system turns the rear cargo area of the off-roading Jeep Wrangler (4-door models only) into a fully lockable, key-operated storage enclosure. It not only allows you to keep items under lock and key while you're away, but it also helps protect them from the elements. The security cargo lid works with the layout of the Jeep and with the rear door. It also features tie-down anchors and a 75-lb. weight capacity to accept additional cargo on top. It is made from strong aluminum alloy and has a highly durable textured powder coat finish to easily resist the elements. 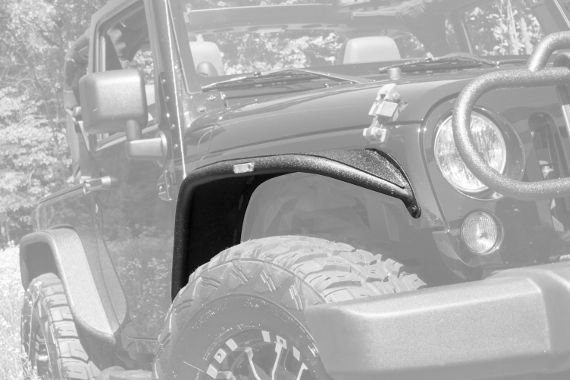 For stylizing the off-road machine, we offer tube doors and fender flares. ARIES tube doors feature an open design with an aggressive cutout pattern. They use the existing factory hinge brackets for easy mounting and are available for both the front and rear. The doors are made with hardened T6 aluminum construction and have a textured black powder coat finish to easily resist scratches and grime. 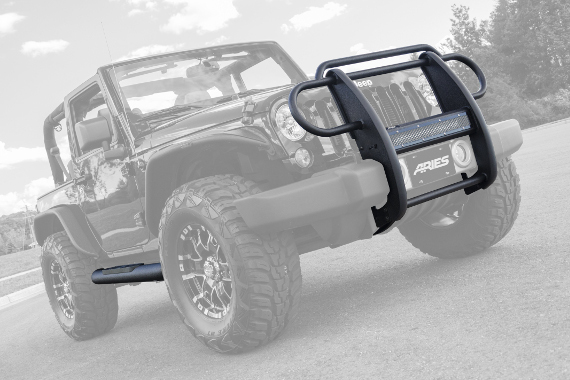 Likewise, ARIES fender flares add style and off-road readiness to your Jeep Wrangler. They feature a 4" width and custom contours to show well with larger, off-road tires. 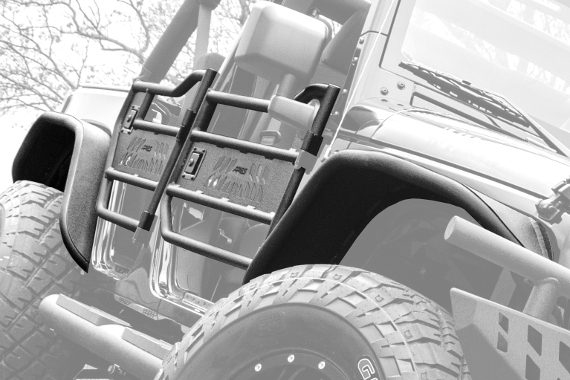 With hardened T6 aluminum construction and a textured powder coat finish, these fender flares are made to go off road.